Sheri, Ted and Jamie were complete strangers before they became work buddies or ‘sandwich artists’ at the newest franchise, “American Hero’*, in a strip mall in any city USA sometime during the recession era 80’s. Bess Wohl’s one act 90-minute dark comedy now making its professional premiere in Carlsbad had its world premiere at the Williamstown Theatre Festival during its 2013 season. The New York premiere at Second Stage was in May 2014. Her quirky, not quite ready for prime time play about self- preservation, the haves and the have not’s, the state of the economy, those on target with their lives and those struggling to make it past GO on a bleak minimum wage salary, is currently playing at New Village Arts Theatre through Oct. 5th. Director Kristianne Kurner and her support team give the production a reality look that almost makes you want a turkey on rye and hold the cheese, no mayo. OK! Enough about cold cuts. As you might imagine, “American Hero” is NOT about the movie American Hero with his super powers to fight crime. No. 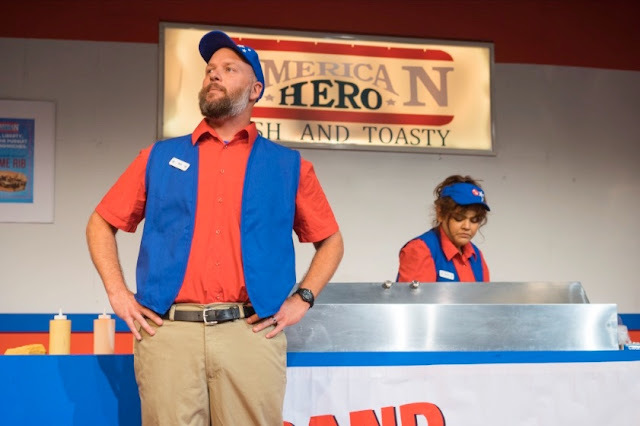 This “American Hero” play is set in a Quiznos/ Subway type walk in sandwich store where Sheri, Ted and Jamie work pumping out foot-long sandwiches with whatever fresh ingredients happen to be on the menu. The store is located not very far from another such franchise in the same mall. Sheri, Ted and Jamie wonder why in the world franchise owner Bob would take such a location. Bob is the franchise owner with secrets we’ll never know about. We find him in the opening scene interviewing the young disinterested looking Sheri. We next have him giving lengthy orientation, of sorts to the rest of his team in a halted and almost foreign language (to him) read. When finished and feeling proud of himself, Bob looks his team over and proceeds to give them their designated jobs: Sheri is baser, Ted is finisher and Jamie is wrapper. He has them practice getting an order ready from beginning to end. It must be done in no less than 20 seconds. When he is satisfied, after about three tries and with everyone in place and pleased with their accomplishments, Bob gives a thumb’s up, gathers his briefcase and hustles out the door. The next time we see him some time later and in the scheme of things he rushes into the back office and starts shouting and ranting in another language and leaves. He didn’t even show up for the Grand Opening leaving the three with open mouth astonishment. Red Flag! Red Flag! Working hard and forming a community of sorts can’t make up for them running out of food. Sheri doing inventory could not access the code to open the walk-in. They assumed Bob would return and help them get back on track. He never did. After calling Corporate every day, they finally spoke to a person and were told to stay open at any cost. They did. They were open longer and lasted on the job longer than did the ham, turkey, pepperoni, multi grain flatbread, diet Cherry soda and chips. They were in a pickle (no pun intended) and left on their own to fend. Sheri moped around but kept her wits about her, Jamie went after Ted with a mission/passion, Ted kept convincing himself that he was a married man and customers were getting pissed off because they were out of all the menu offerings. One night while sleeping at the store Sheri had a wild dream that a signature sandwich in the form of a super hero called on her to do something big. When she woke she came up with the idea of making and selling PB&J and tuna sandwiches on two kinds of bread, with a small sweet dessert to placate the customers who couldn’t get their foot longs. They didn’t need Corprate for those items they just went to the super and bought them. It worked. “I’ll make a kickass tuna sandwich”. It didn’t pass muster when Corporate heard about it, but that’s par for the course. From minimum wage to hourly pay, to health insurance, and big business, family and kids divorce and having affairs, to how to wrap a sandwich 20 seconds and how to work as a team are all touched on here as the recession of the 2008 still reverberates in the minds of Sheri, Ted and Jamie. These are the American Hero’s we take for granted every day as we stand in line and watch them put those grinders together, finish and wrap. Theses are our American Hero’s waiting on tables, bussing and washing dishes trying to stay afloat while their Masters Degrees gather dust. What he hell. We’ve all been victims at one time or another. Great ensemble work features newcomer Cecelia Harchegani as shy and unassuming Sheri (yes with an i) who needs two jobs to support her father’s illness. Ms. Harchegani is off to a great start. 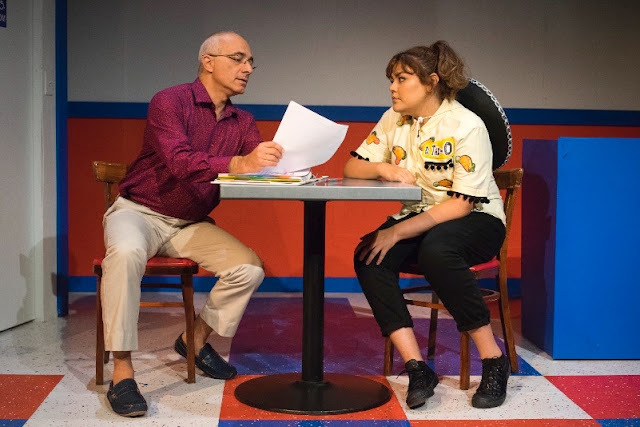 Kamel Haddad’s Bob, a former doctor in his native Middle Eastern country, is excellent as he assumes several different characters and different wigs. Let’s keep him busy. Wendy Waddell’s Jamie’s is over the top funny and over the top serious in her desperation to win her custody battle with her husband. She’s always a pleasure to see on stage. Dallas McLaughlin’s Ted is the over optimistic lost soul and up tight guy in need of pitching corporate BS to makes his points. I need to be more convinced by his character. The production ambles along zeroing in on the dark as in comedy to prove a point. And that might just be the point where the playwright might want to dig deeper into her creations rather than make them stock characters. While yours truly never wrapped herself around the humor, dark or otherwise, cynical perhaps, it just never tugged at my tickle bone. I got the message in spite of the sit-com and predictability of Wohl’s essay. Understanding the frustration and fear of dealing with an uncertain economy, being dumped by a loved one, struggling over custody for you kids and losing a high paying job at Bank of America, and moving in with your in-laws (a place that smells like Depends and milk) you will be able to understand the why of the three staying put to save their themselves and knitting and bonding as a unit. It happens now and happened then although I can’t say with any certainty it all ended happily ever after for Wohl’s characters. Shaun Tauzon ‘s costumes are made to fit this American Hero store matching colors with the flag and some mirror the colors of the walls. Uniforms all matching, they looked pretty professional. After work, Wadell's red spandex, another story. Kristin Flores designed a sterile stainless steel counter is where the makings for the sandwiches are kept a la Subway. Large menu's hang on the walls and in front of the counter and a large neon sign hangs over their heads. Christopher Renda’ s lighting is perfect especially during the dream sequenced. Melanie Chen Cole’ sound design “Chariots Of Fire’ “The Girl from “Ipanema” fit appropriately for this show. The moral of the story? “Don’t give up on your dreams” and always thank (tip) your local sandwich artist.